Pitch: a seemingly united family falls apart when hidden feuds emerge and each member struggles to cope with their individual problems. Synopsis: Jack, a 45 year-old plane mechanic, has just been fired from his job following the post 9/11 downsizing. His wife Suzanne is struggling with a midlife crisis, having bought an art gallery to explore her artistic aspirations and host an illicit affair. Ben, their oldest son, is a pot-smoking nihilist with a good heart, unable to leave a family he loathes or an cubicle job that is consuming him. Jason, his younger brother, is a popular teenager whose only failure is being unable to gain his father's admiration. Finally, Clement, the youngest brother, is a bright young kid who suddenly refuses to react to anything or anyone. Upon consulting with a specialized psychotherapist, the family discovers that Clement is delusional. He believes that the pollen floating in the autumn sky is a race of tiny aliens and has chosen to be one of them. This curious behavior is the unsuspecting trigger to the family's slow disintegration. Confronted with this peculiar withdrawal from life, Jack, Suzanne, Ben and Jason are faced with their own demons and each seek ways to escape them, be it alcohol, religion, drugs or video games. As Jack struggles to keep his household together, Ben desperately seeks to rip himself from his current situation, Jason understands that he will never outshine his older brother in his father's eyes, and Suzanne's infidelity breaks up her marriage. While each has their own means of escape, Clement remains the only one unfazed and unaffected, prompting us to wonder whether it is best to be happy while out-of touch with reality or to confront people and problems head-on at the risk of living a painful and miserable life. 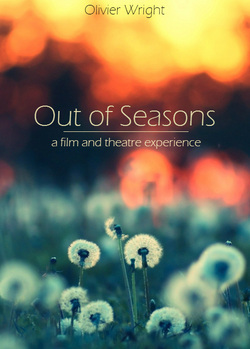 Film & Theatre: Alongside the "Out of Seasons" screenplay for cinema is the "Out of Seasons" play for theatre. The idea is this: instead of having a play from which there is a movie adaption, or a movie from which a theatre play is adapted, both forms in this case have been written together and designed to provide complementary entertainment. This does not mean that their plots are different or that it is necessary to view both in order to grasp the full story. It simply means that it provides the audience with a fresh viewing experience : you can see the film, or the play, or better both. Here is how it would be done: the objective is to shoot the film version with a main cast of actors (the 5 members of the family) who are able to act for film and theatre, so that it is the same core actors who are on screen and on stage. The film version would be released first, and then the theatre version would start running concomitantly and then continue on after the film ends its run. The theatre version seeks to be ground-breaking in its own right, mixing the classical elements of theatre with elements of the cinema form and the modern technologies of digital 3D. During the production of the film, specific shots would be made with the needs of the theatre version in mind. The set would then be designed specifically for this show, so that film and actors can interact.